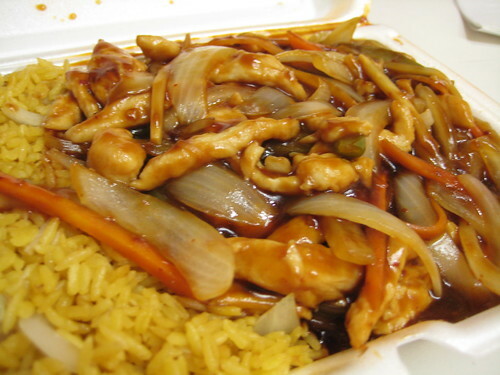 Knowing full well that most Chinese takeout is Americanized and unauthentic, still I like it. The value of any takeout joint is in their MSG-laden lunch specials. I was perusing through a menu one Sunday afternoon and having difficulty deciding what to order. Since most menus lack sufficient descriptions and very few places take photographs of their food, how do you tell the difference between dishes? Thus, I embarked on a mission to sort out the spicy chicken dishes at China Express. All of these dishes are marked as spicy on the menu. Just about any dish can be spiced up on request, but some dishes are naturally are hotter than others. To be consistent, I ordered each straight off the menu without any additional direction. So from August 16th until September 13th, here are my findings. Kung Pao chicken was not at all what I expected. Aside from the cherry tomato-sized chunks of chicken, there were carrots, celery, cashews, broccoli stems, green pepper, and lots of peanuts. All tossed in a salty brown concoction that reminded me more of a turkey gravy than stir fry sauce. There was evidence of some pepper seeds and a few pepper flakes, but I didn’t find it spicy at all. The best part about this dish was the juxtaposition of the ingredients’ textures; crisp celery and crunchy peanut mixed with the soft and tender chicken. 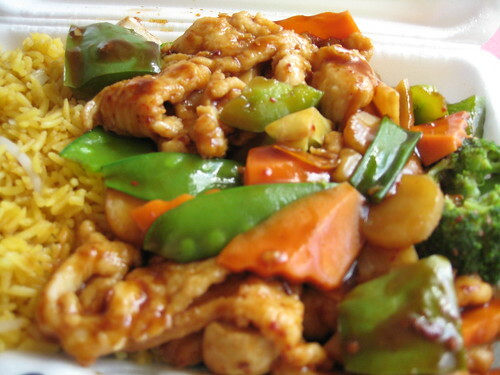 Hunan chicken is stir fried strips of chicken mixed with large chunks of green peppers and carrots, broccoli florets, water chestnuts, pea pods, and mushrooms. It looked very appetizing. The mixture is tossed in a brown sauce with red pepper flakes. It didn’t strike me as that spicy, though my sinuses were clear afterward. Aside from the inclusion of mushrooms, it’s the most forgettable dish of the bunch. Mandarin chicken is breaded and deep fried, just like you would expect of sweet and sour chicken. After frying, it’s mixed with large chunks of carrot, onions, green peppers and water chestnuts. The whole thing is tossed with a sweet and spicy sauce. Large pepper flakes were visible throughout the dish; my sinuses were definitely clear after lunch. Szechuan chicken consists of thin strips of chicken, julienne carrots, onions, and green peppers, stir fried in a zesty red-orange sauce. A few bites would be suitable for someone not into really spicy foods, though the whole dish might cause them some pain. Some small red pepper flakes could be seen, but didn’t overpower the flavor. Initially warming, the spice builds in intensity throughout the meal; by the end of it, you’ll need to blow your nose. Of all of the dishes I tried the Kung Pao and Szechuan dishes stood out as my favorites, though I’d definitely substitute the Mandarin Chicken the next time I was craving Sweet & Sour. 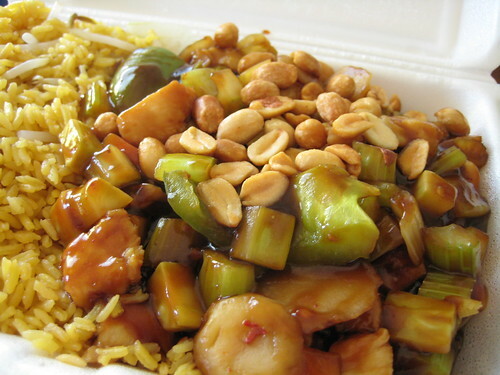 The texture of the Kung Pao was unique and enjoyable. The Szechuan had a great flavor and gradually building heat. Thre of them were spicy, but nothing that made me sweat. Now that I know what each dish consists of, I may ask them to spice them up a bit more next time. 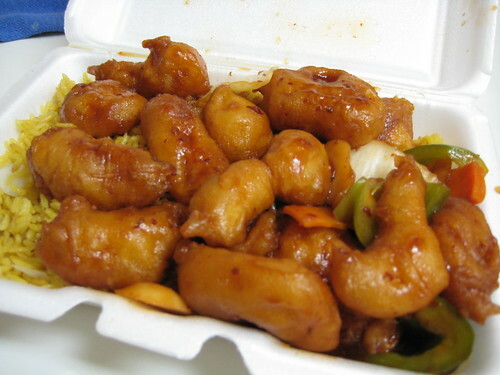 I also have a weakness for Chinese food from the mall. It’s a guilty pleasure. Fun write up. Your photos make the food look much better than the restaurants ever do. I get their Kung Po tofu a lot, and it varies widely in the spice department. Last week, it was…flavorful, and the time before that, outright bland (hot sauce to the rescue!). A few weeks ago, it lit me up a bit, and I have a high tolerance for spicy food. I wish they’d pick a heat though. Elizabeth: At the mall? As in, in-the-moment Panda Express? Johnny: I’ll definitely be trying some of those dishes again, having found new favorites. I find that a lot of times it just depends on the cook that’s in front of the wok; find out what their schedule is and you’re more or less set.